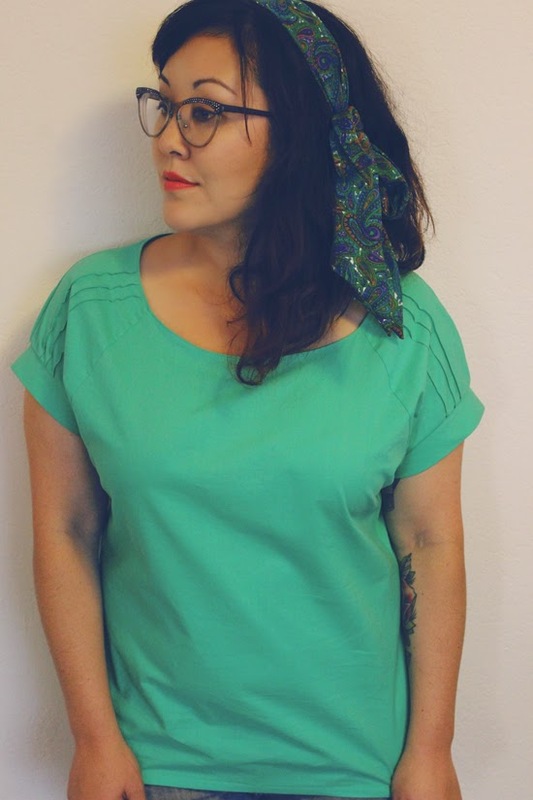 When Caroline announced that Sewaholic was doing a competition for their latest pattern, the Belcarra, I knew I was in. What can I say, I'm a sucker for a sewing competition! 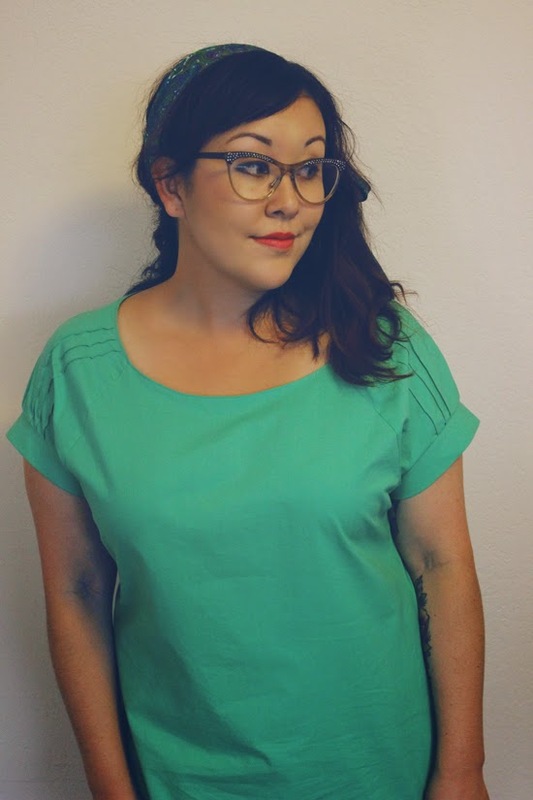 I had already planned on making the top (I've been on a major top sewing kick this year), but this was the perfect motivation to get it completed sooner. I chose to sew version two which meant I had to use a lawn fabric (instead of the voile that was recommended for the other two versions) to make sure the tuck details would show up and stay crisp. Two yards of this pretty lawn from Michael Levine did the trick! The sewing portion was straightforward, however, I did have to reference Caroline's sew along post when it came to the tucks. Tucks aren't something I regularly sew, so the refresher was nice to see in photos. I do like having the detail on the sleeves, but I almost like the reverse ("wrong") side better and will probably do the tucks that way for my next version. And just an FYI, I don't know what my problem is, but I always have trouble attaching cuffs and setting in sleeves (I didn't set in sleeves on this top, I just wanted to throw that out there). There is always some kind of puckering action going on, but by now I know that I need to baste everything first. And then probably rip it out and baste again. And again. I've been debating if I angered someone and they put some kind of setting-in-sleeves curse on me or something. Isn't the vintage scarf in my hair cool? It's very special to me because it was a gift from Rochelle! If I remember correctly, it used to belong to her aunt, her aunt gave it to Rochelle, and Rochelle gave it to me. I love wearing scarves in my hair and this treasure gets worn the most. Are there any other sewing competitions/challenges going on that I should know about? Do any of you have any tips or tricks for attaching cuffs and setting in sleeves or am I just doomed? I must have angered the same god as you, because I can never set sleeves in without having to rip out tucks at least once! Even when I put them in flat I usually have to do some minor surgery to get everything right. I've also been known to serge giant holes through my sleeve caps when finishing seams, so I just don't like sleeves. Not to mention that when I do get a perfect sleeve the first time, it's probably on backwards and I'll have to rip it out and start again anyways! Ack! So I feel your pain with sleeves. And I am in love with that blouse. The color is great and the tucks are beautifully done! Did you make any alterations to the neckline width? 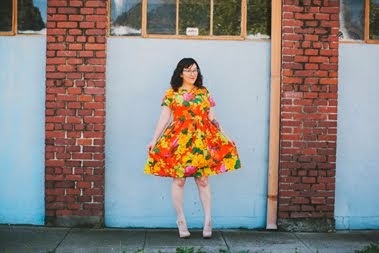 The photos on Sewaholic's website make it look much wider and kind of turned me off from the garment, but I really like your version! 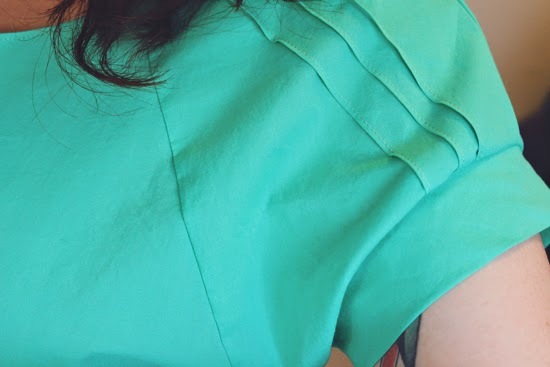 That's a really pretty color on you, and I love details like pintucks, as it can make a plain item look special. foot with your finger. Hope it helps you too! I just love those tucks! Definitely makes me want to add this pattern to my collection! I love this! The tucks and cuffs are so perfect, and the color looks great on you. I wasn't so sure about the Belcarra before, but now I really want it! Oooh nice tucks :) This colour is fabulous. Thanks, Nicole. I think you will really like the pattern! I'm definitely going to try this. Thank you!!! I didn't make any alterations to the neckline at all. The stripe matching on the sleeve in the tutorial?! I feel an urgent need to go home and set in a sleeve. I haven't got the pattern because I have a similar vintage pattern I wanted to try. But maybe I'll try out the Belcarra at some point! p.s. you're such a babe.